Concrete decorations for the yard, especially birdbaths, are heavy and immobile due to the weight. 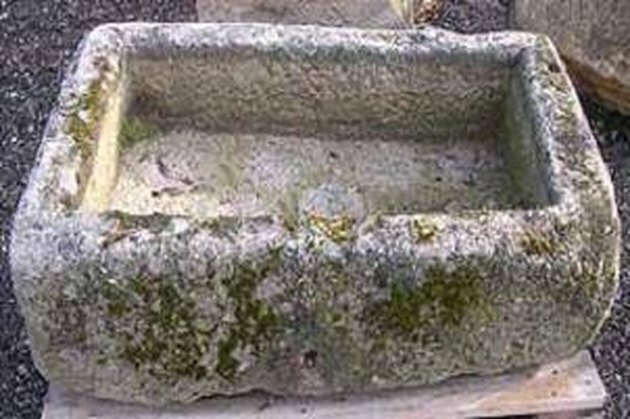 A hypertufa birdbath looks like concrete but is more lightweight and easier to manage. Use any container as a mold for a birdbath. Look around, find a design that is preferable, and make a hypertufa birdbath. Gather all ingredients in a well-ventilated area and don the face mask, gloves and apron before mixing. Lay plastic sheeting over working surface. Mix 1 coffee can of sand, 2 coffee cans of peat moss and 1 coffee can of Portland cement in a bucket. Add 1 handful of fiber mesh to the mix. Prepare the mold by placing the two garbage bags inside the mold. Smooth out all wrinkles, as this will transfer to the hypertufa. Lay one garbage bag inside the mold and the second garbage bag on top of the first one. Add water to the dry mix in small amounts. Mix the water in with the trowel. Consistency should be like bread dough, just dry enough to mold with the hands. Press the mixture inside the mold on the garbage bags. Continue until the entire inner surface of the mold is covered with the hypertufa to at least 1 1/2 inches thick. The bigger the bowl is, the thicker the hypertufa needs to be. Wrap garbage bags over the mixture and let the mold dry for 2 to 3 days. Do not move the mold at this time because the hypertufa will fall apart. Test the mixture to see if it is dry by pressing a finger into the mixture. If no indentation is noticeable, it is ready. Slowly remove the birdbath from the mold by turning it upside down and taking the mold off. Leave the birdbath in a shady spot for at least 2 weeks to cure. Mist the birdbath daily during curing. Waterproof the birdbath by using hot liquid paraffin. Heat the paraffin, according to package directions, and coat the inside of the birdbath. Allow to dry completely before adding water.